Added new Encr_GeneratePassword function, which can generate a strong, random password with a specified length. Also created a new example file to demonstrate all possibilities. Added PHP 7 encryption compatibility. You can now AES-256 encrypt text with the plug-in and and decrypt it with the OpenSSL functions of PHP 7. 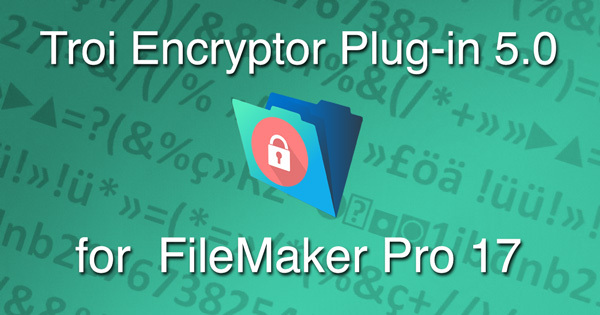 You can also decrypt text with the plug-in which was encrypted with the OpenSSL functions of PHP 7. Also created a new, extensive example which demonstrates how to encrypt and decrypt data for or from PHP 7. Improved the command line interface compatibility of the Encr_DecryptAES function: you can now decrypt text created by the openssl command in a command line interface (for example the macOS terminal). Renamed the function Encr_EncryptRijndaelAES to Encr_EncryptAES and the function Encr_DecryptRijndaelAES to Encr_DecryptAES. Improved the 64-bit compatibility of the plug-in and fixed a compilation problem with code signing and extended attributes in Mac OS 10.12 (Sierra). More detailed information on all changes and improvements implemented in Troi Encryptor Plug-in 5.0 can be found on the Encryptor Plug-in page.